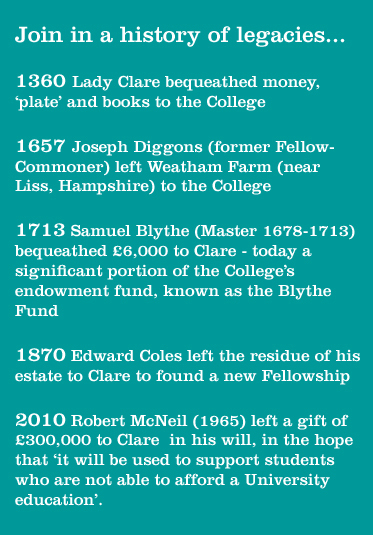 Over almost 700 years, legacy gifts have sustained and shaped Clare College for future generations. In 1999 Paul Mellon (1929) left a legacy of £4.4m to fund capital improvements and major repairs to Old Court , the Chapel, the Bridge and Gardens. In recent years, the income from the Paul Mellon Clare Trust has been used to repair Clare Bridge (the oldest spanning the River Cam), provide the College with much-needed new kitchen facilities, and build a glasshouse to help maintain the exemplary standard of the Fellows' Garden. Ian Campbell (1965) read Natural Sciences at Clare and was tragically killed in a car crash in 1970, shortly after leaving the College. Whenever they moved houses in the following years, his parents renamed their homes Clare Cottage in memory of their only child. Ian’s mother, Edith, died in 2012 and left a third of her estate to Clare College, with the request “to set up a bursary or scholarship, at the total discretion of the College, in memory of her late son”. The Ian Campbell Memorial Bursary is awarded annually, in perpetuity, to a Clare undergraduate or postgraduate in financial need, without subject or geographical restriction. Harrison Watson left a legacy in 1953 of $50,000 to provide a studentship for research into the causes and care of tuberculosis and/or diseases of an allied character. Holders of the Harrison Watson Studentship at Clare include Professor Sir Mark Walport, currently the government's Chief Scientist and former Director of the Wellcome Trust. Sir Geoffrey Elton (1949) left a gift to Clare in 1995, which has been increased by donations from some of his former students, to support research in History. The G. R. Elton Fund is used primarily to support a Postgraduate Research Scholarship in modern European history. In 1930 Edward Mallinson left a gift to support Modern Languages at Clare. Today, the Mallinson Fund provides an annual prize for academic distinction in Modern Languages, travel grants to enable Modern Languages students to travel abroad for educational purposes, hardship funds for graduate students in financial difficulties, and a Mallinson Studentship for a PhD student in Modern Languages. Though not an alumna herself, Phyllis Lee was a much-loved member of the Clare community. Phyllis’s husband, Hardy, had been at Clare (1929–32) and she remained devoted to the College, especially its musicians. She was herself an accomplished performer and took a keen interest in nurturing others’ talents. At her home in Millington Road, she often hosted musical soirées to encourage aspiring instrumentalists (including a certain Trinity College student, HRH Prince Charles). She was also a regular concert-goer, attending recitals in Clare until her death in 2007. Phyllis left a substantial legacy to the College to support instrumental music, with the hope that it would enable Clare to continue its already-established tradition of musical excellence for future generations. So far, Phyllis’s generous gift has supported a variety of musical events and opportunities for our young musicians. Many more such events will be possible in the future, thanks to Phyllis Lee's lasting legacy.